Build a better website by discovering what technologies other sites use. 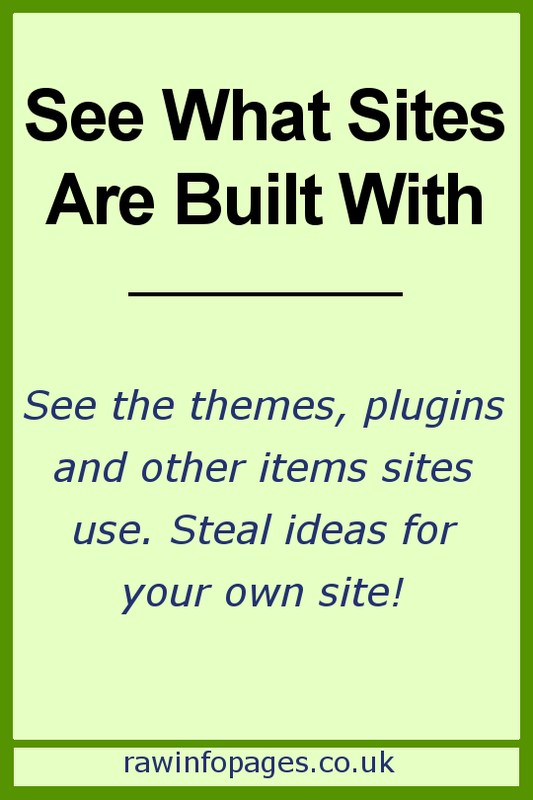 If you see an impressive site, see how it is built and then use the same things on your own site. Learn from the best! 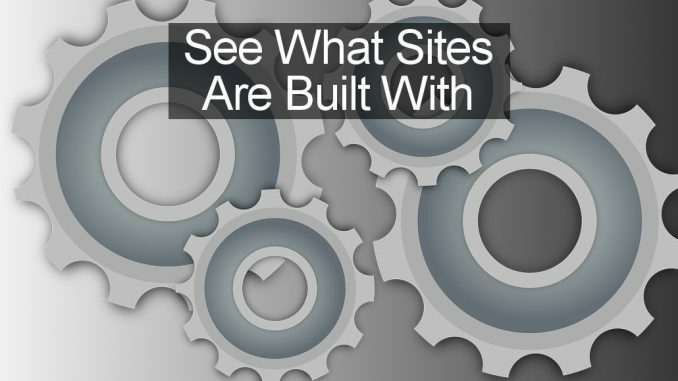 When you see a great website, do you ever wonder how it is built? What technologies lie behind it? Does it use WordPress or something else? Which plugins and other items does it use? If only we knew what others we using, it could give us ideas to improve our own blog or website. If we see a great slider showing an image gallery on a site while browsing the web, wouldn’t it be nice if we could see which plugin it is and then add it to our own site. We don’t want to copy other websites of course, and we want our own unique place on the web, but what differs between websites is not the technology, but the content and also the way it is presented. WordPress, plugins and themes all have numerous configuration options, so even if we know exactly which ones another site is using, it would not make our site identical. We can still make an original site, but with better tech. There are over 55,000 WordPress plugins and it is hard to know which ones to use on your site. Sometimes people write articles listing their favourite plugins and these are enormously helpful. Apart from a few common ones, I always seem to use different plugins to the ones people list. However, it is fascinating to see what people use and articles like these give you ideas on what to use for your own site. How can we find out what other websites are built with? One way is to look at the source code of the page. Right click a page and most browsers have an option on the menu to show the source code. Reading source code is not easy though and even when you can, it is slow and tedious work. It is much easier and quicker to use either a Chrome extension or a website tool that shows exactly what other sites use. Here are some examples. BuiltWith Technology Profiler is a Chrome extension that adds an icon to the toolbar to the right of the address box in the browser. Click it and it displays a panel that lists everything it can discover about the site. This is the compact view with descriptions hidden – there is a much more comprehensive view if you need more information. Look at that scrollbar, you can see there is at least another two screens of this. It contains a lot of details that are valuable, such as analytics and tracking and widgets. 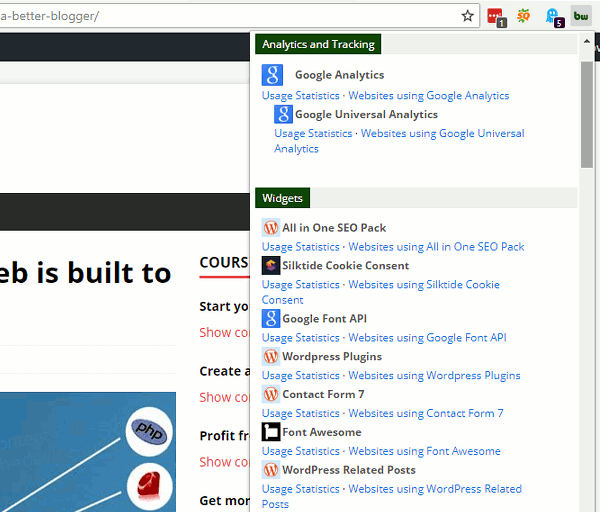 The list of widgets is the most useful and it shows the plugins that a site uses. There is information about access from mobile phones, advertising, web server and more. This is an excellent extension for people that need a lot of technical information about a site. 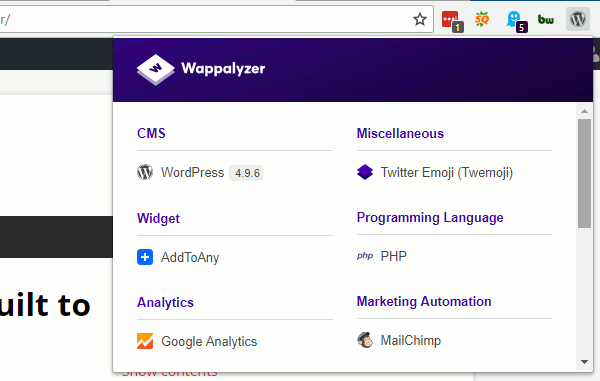 Wappalyzer is another extension for Chrome and it adds a toolbar icon. Click it and it reveals a much simpler drop-down panel than BuiltWith. This is very good for non-technical people that simply want to know what widgets, plugins and other things a site is built with. The information is presented in the clearest way possible and it is just what you need when browsing the web, looking at other sites for ideas. There isn’t much to say about it, it looks great and it just works. Get it and see what everyone else is using on their websites. 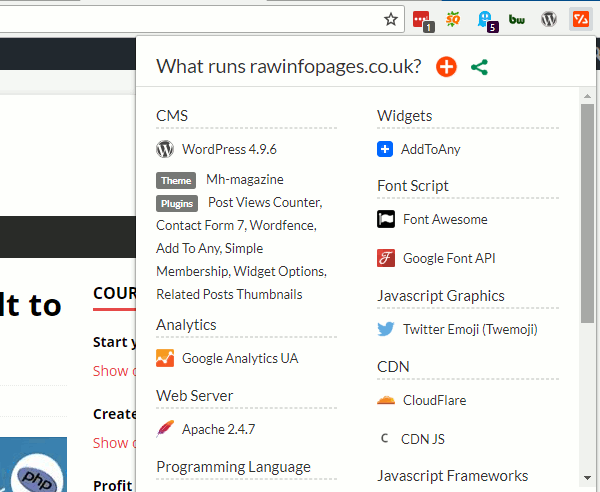 WhatRuns is another useful extension for Chrome and as usual it adds an icon to the toolbar in the browser. Click it when viewing any website and it displays a drop-down panel with information on the technologies used to build the site. The information provided about websites is the most comprehensive of the three extensions and it correctly identified the theme used, most of the plugins and widgets. The panel displays information in a simple and easily readable form and it is my favourite one of the three. From testing my own sites it is clear that the information displayed by these Chrome extensions is quite accurate. They tell you a lot about the content management system, the plugins, themes, advertising, tracking and more. None of them is perfect and they missed a few things. However, they are surprisingly accurate and this makes them very useful. 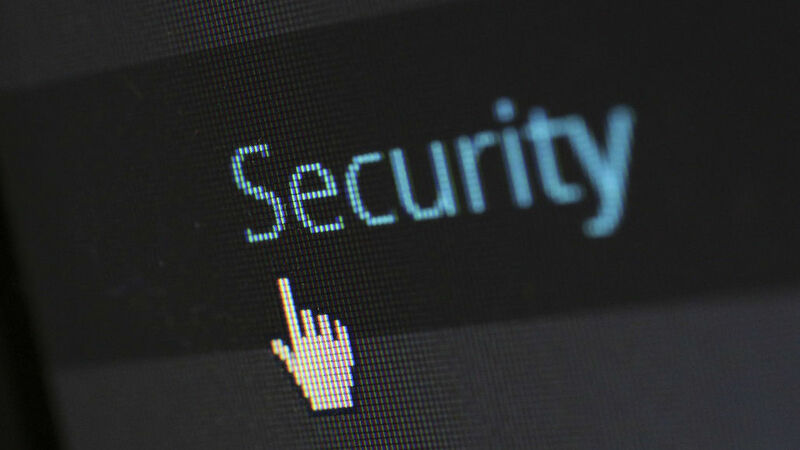 If you try them on sites while browsing the web, you sometimes see very little information is revealed. It is possible they are using custom designed websites, plugins and themes, but it is also possible to hide quite a lot of information in the source code of a web page. The amount of information therefore varies from site to site. If I had to keep just one, I think WhatRuns would be the one.